Peaceful demonstrations of this magnitude are miraculous. I bought my ticket to Washington DC shortly after the election, when I heard a protest march might be forming. It was a reaction to the relentless waves of emotions I was feeling: disappointment, shock, sadness, and worst of all, fear. I felt fear that our new President had normalized and made acceptable the denigration and dehumanization of women, minorities, and people with disabilities. I felt fear because after years of supporting anti-bullying campaigns at our children’s schools, our nation elected a bully to be our leader. I felt fear because my beloved Jewish community was tearing itself apart, as people made different political choices believing they had the best intentions and acted out of love for their community. Tragically, this election polarized our community and divided us. And that makes my heart ache and I find it unacceptable. As I left my house at 5 AM on Saturday morning on my way to DC, every cell of my body resisted. I didn’t want to be marching. I didn’t want to celebrate or protest. I didn’t want to raise my voice or be part of something bigger. All I wanted was to be home with my family. I stayed very quiet all morning, turning down the noise of the outside world and looking inward for insight. What is my purpose? How do I stay true to my values? What if I see something I don’t agree with? How do I protect my integrity? This is what I learned from my first protest this weekend. Protesting is physically grueling. When you are part of a crowd of half a million people, standing and walking for more than 5 hours, your body hurts. I am in awe of all of the people who showed up, especially of the youngsters, elders, and people with disabilities who were determined to be counted. The efforts and personal investments that people made were inspiring and encouraging. Peaceful demonstrations of this magnitude are miraculous. It was an important reminder of the potential goodness of our people. 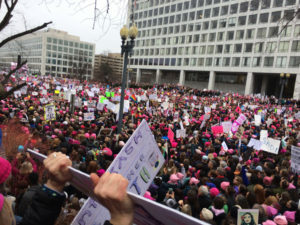 I didn’t agree with everything that was said and done at the march. I will continue speaking out for the issues that are important to me, while also not staying silent on issues that go against my moral compass. Our administration masterfully changed the conversation away from the world-wide protests to the inauguration. This type of spin undermines our intelligence and will only get worse. Uncertainty is deeply uncomfortable and unsettling. It is also the nature of being human. It is very challenging to stand one’s ground. But doing nothing is also a choice with consequences. I’m proud of so many people for showing up at the marches around the world. Now we have to keep showing up in our communities. I share the concerns you so eloquently stated. With a first Executive Order Trump banned Federal funds to non governmental agencies that support a woman’s right of choice. I wish that would be the phrase used not the word “abortion”. I worry about the Supreme Court Justices chosen under Trump. A court that will be conservative. In a word I “worry’. I really appreciate your thoughts and couldn’t agree more. Bev, I share your feelings. We are living through troubling times. And this is just the beginning. Marita, I agree with you 100%. We must keep this dream alive. We are being torn apart by Trumps policies and must work in unison to kee our high principles In tack.